Re + search is searching again. The primary function of reading literature is enjoying it. Literature enriches human mind. It tells about patterns of life. It gives insight and makes us think from the point of view of others. Literature makes us understand society and its relation to the individual. Literature is expression. Expression is essential for human survival. Reading and enjoying literature is a complete process within itself. Researching literature enhances the joy, creates new patterns of meaning and helps us in understanding life better. Aristotle said that analysis is human intuition. A human being is human because of her/his analytical capability. Literature is a record of human experience and wisdom. Researching literature is like polishing that experience and wisdom. For example, all of us have read Ode to a Nightingale. It is a beautiful poem. It soothes the reader. It satisfies us in a strange way. It makes us forget where we are. It lifts us to the world of the bird. If we research upon this lovely poem, we know the personal life of the poet. What caused him to long for the flying life of the Nightingale. We know the meters which perfect this masterpiece. We observe that throughout the poem, there runs a binary structure that adds to the aesthetic beauty of this poem. On one hand we have this mortal world which signifies pain. On the other hand, we have the other world which signifies joy. The whole poem is a perfectly balanced song between bird, hungry generations, treading, sick and tearful Ruth, cheating, deceiving, plaintive anthem and waking on one hand AND death, immortality, song, charmed magic fairy lands, fancy, elf, dreams and sleep on the other. The poem is sitting as though on a perfectly balanced scale of this and that world. We may not realize on a casual reading. But much art has gone into making this poem what it is. Humans love binaries, comparisons and examples. This is the appeal of this poem. Then poem is a well-crafted Raga of opposite notes. This can be one example of how research enhances our joy and understanding. Now let us turn to approaches and procedures of literary research. Research is an academic and intellectual work. It is a systematic study of one or more than one literary text. The purpose is to give a fresh approach to the study of the chosen topic. We often re- evaluate a work of literature through research. For example, Tennyson was highly popular while alive and he adorned high places. However, through subsequent years through re- evaluation, his poetic worth has come down. Emily Dickinson was not known during her life time. After a century, through extensive and dedicated research, her worth as poet was established. Today, she is a touchstone for symbolic, spiritual poetry. We also apply literary theories on texts. Post colonialism, feminism, structuralism, poststructuralism, neo historicism - these theories are applied on texts and fresh insights are drawn. For example, Shylock was a Jew, Caliban and Othello were black! Was the bard racist? We also study a text numerically. How many words have been used? How many words from flora and fauna and how many from royal court? How women are addressed? How many new words Shakespeare created? So, on and so forth. We also research upon literary texts to develop new understanding of human life, sometimes even bring a new idea or theory. These are basically the types and objectives of research in literature. 6. A combination of two or more methods. The process of research in literature starts with selection of a topic. We can choose from novel, poetry or drama. Selection of topic is important as it decides the major course of research process. We want a contemporary author or not. Do we identify with topic or not? Usually it is seen that a researcher works better if the topic comes close to her/his heart. A family which migrated from across the border will study partition literature with more intensity and sincerity. Although nothing is carved in stone, yet an effort must be made choose a topic which interests the researcher. Collecting the books (primary sources) and reading them is the next step. Using dictionary, taking help from the supervisor, friends and teachers, the researcher must develop a thorough understanding of the books in question. Formulating a hypothesis and writing a synopsis comes next. We should know what we are going to do. A clear-cut plan is essential. We should know broadly which type of research we are interested in. Once the synopsis is done, we come to exploring secondary sources. The researcher should read what has already been written on the author - books, research papers, online articles, newspaper articles, monograms etc. Research requires money and patience. Research is a luxury. It is always good if the research is funded by the UGC or any other funding agency. Traveling, going to libraries, printing online sources, downloading and paying online fees etc requires money. A researcher should have appropriate financial backing. Then comes writing the first draft. Language is magic and the researcher in literature has to be a magician. We should remember that it is easy to be difficult but difficult to be easy. If one cannot explain it, one does not know it. We should not make any extra effort to look scholarly in our language. The purpose of language is communication, reaching the other person; nothing else. If our words are not understood, they are futile. Along with the first draft, revision, correction, writing research papers and attending seminars form necessary components of research. Publishing papers, presenting papers in seminars and academic exposure make our research meaningful and add value to it. We should realize that research is about "doing", about getting involved, about leaving everything else and focussing on the topic. We may know all procedures, all methodology but if we do not practice it, it is of no use. Researchers of the world are supposed to be intellectual leaders who lead the world through ideas. Formulation of ideas is important and equally important is expression. As we go on the path of research, we realize that it is about crossing inhibitions and entertaining all types of ideas. A researcher not only has an enhanced personality but also helps others in widening their horizons. Finally, we come to writing the final draft. After submission, we wait for the oral presentation and Viva voce examination. It is during our interview we realize the importance of presenting papers in seminars. Viva, the word comes from Latin which means "with the living voice". This examination is conducted to ascertain that the thesis is the work of the researcher and is not plagiarized. The researcher has understood what s/he has written. The researcher is aware of the relation of the work with other works of the field. No research project works in vacuum. The research work is part of a larger body of knowledge and therefore an awareness of connectedness is needed. Finally, Viva is conducted to see and suggest further research. It is advisable that the researcher practices for the Viva examination. A researcher does not give good impression when s/he is questioned on shortcomings of the work and s/he says that it happens in all works or the mistakes are typing mistakes or blames the supervisor for mistakes or says that the mistakes are not important. The researcher makes a good impression when s/he takes responsibility for the work, does not take criticism emotionally, takes time to reply and uses the questions as an opportunity to showcase her/his work. The usual questions revolve around summing up the work, what new the researcher has given, and why the work is important. The best advice for Viva is, honesty is the best policy. After discussing the process and stages of research, we come to its soul or what is known as philosophy of research. This aspect is important to literary research. A research philosophy is a belief about the way in which data about a phenomenon should be gathered, analysed, and used. The term epistemology (what is known to be true) as opposed to doxology (what is believed to be true) encompasses various philosophies of research approach. Ontology is the fundamental nature of reality. It is about naming and defining the types, properties and inter relationships of the entities that really or fundamentally exist for a particular domain of discourse. Ontology decides the universe of our research. For example, if the researcher believes that hell is a physical entity under the ground and then studies the physical locations in Dante's inferno, the study will be a work of fantasy. If the researcher understands the symbolic meaning of "hell" and "inferno", then he studies of The Divine Comedy will be literary. The world view of the researcher is paramount. The topic, the approach, the selection of references, and presentation - everything depends on the world view. What entities exist or may be said to exist and how such entities may be grouped, related within a hierarchy and subdivided according to similarities and differences. Ontology has tremendous practical application was it decides the framework of research. For example, an innocuous sentence like “Allahabad University is Oxford of the east” or “Kalidas is our Shakespeare” has horrible colonial hierarchy hidden in it. People easily say such sentences. “She is educated; she wears trousers,” or “I am health conscious; I take sushi,” or “He is rustic; he eats jiggery”. They do not understand what they are saying. Being conscious of our view of reality is practical application of ontology in research. Epistemology is the theory of knowledge, especially with regard to its methods, validity and scope and the distinction between belief and opinion. 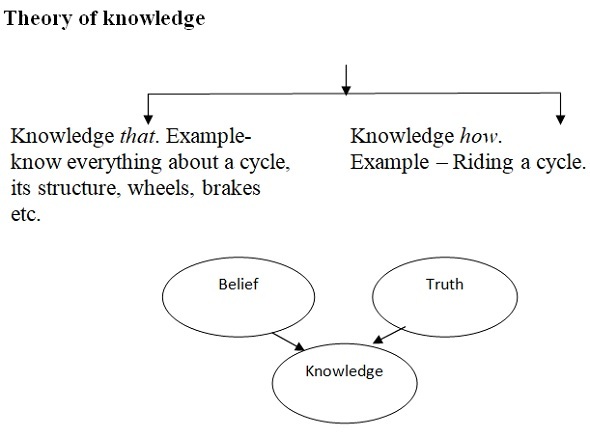 How to reach knowledge? For example, one studies Tribal Literature, consults dictionary, visits libraries, talks to scholars and forms an opinion. The other person goes and starts living with tribal people and gets to know them. These are two ways of acquiring knowledge. For a researcher, it is a combination of the two. A paradigm is a typical example or pattern model. A paradigm is a standard, a perspective or a set of ideas. A paradigm is a conscious way of looking at something or thinking about something. In literature, we have loosely two paradigms - positivism and phenomenology. 1. The world is perceived as external and objective. 1. The world is conceived as socially constructed and subjective. 2. The obeserver is independent. 2. The observer is part of the scene being observed. 3. Value free approach should be applied in science. 3. Human interests should drive science. 4. The focus should be on facts. 4. The focus should be on meaning. 5. The focus should be on fundamental laws. 5. The focus should be on meaning of events. 6. Phenomenon should be taken as separate, simple element. 6. The researcher should explore the totality of each individual case. 7. The process is hypothesis formation and testing. 7. Ideas are developed by induction from data. 8. Concepts are operational. 8. Different methods should be used for understanding different parts. 10. The researcher stands apart. 10. The researcher is part of the research object, matter and theme. Positivism is supposed to be the scientific paradigm. It proves or disproves a hypothesis. The method is used for generalizations. Auguste Comte, a French philosopher coined the term, meaning thereby that reality can be observed. Aristotle proposed deductive reasoning. It goes from top to bottom. For example, women are emotional; Avani is a woman; therefore, Avani is emotional. It is called syllogism where two statements are used to prove the third. Descartes propagated realism based on how we see the world. Galileo's scientific method comprises of three steps - resolution: demonstration: experiment. Francis Bacon proposed inductive reasoning which advocates systematic observation. He supports generalization but not over generalization. Karl Popper amended positivism and brought what we know as post positivism. Theories, background, knowledge and values affect research. However, the researcher should strive for detachment and objectivity. Phenomenology is the other paradigm. It is also called interpretivist approach. It believes that reality is indirectly constructed based on individual interpretation. Reality is subjective. People make their own meaning and often research is meaning making. Events are distinctive and cannot be generalized. There are multiple perspectives on one text or event. Bookish knowledge is to be perfected by application and experience. Interpretation is not a simple process. Therefore, we should not generalize. Phenomenology is difficult to be applied in scientific research. In literature, phenomenology is useful; however sometimes scientific approach also helps. A mixed approach keeping the demand of the text should be applied. It is highly interesting to delve into ancient Indian research methodology, especially in relation to the study of modern literature. We as Professors of English in Indian Universities study current novels, poems and also explain them to our students. We know the research model of the West and follow it. Our ancient Indian methods make it additionally rich in analysis and inference. It is like equipping ourselves better. The first premise to be understood and imbibed is that literature in ancient India was science. Based on "pramana" (proof) and "ukti" (exact reference), the creation and study of literature was scientific study. That is why it is called sahitya shastra. The use of the word shastra signifies its stature as science. Our sages took things seriously. Even "pramada" (fun, frolic) was studied in all its aspects and details. Before starting the research project, four things are to be considered consciously - vishaya (subject), adhikari (suitable researcher), sambandh (relation of the researcher to the topic) and prayojana (purpose of the study). It is an extremely scientific and fulfilling beginning to the research project. We have to choose the topic after careful consideration. The researcher must be able, wise and well versed in shastras (scientific treatises). It must be stated clearly as to what is the relation of the researcher to the topic. For example, if a Dalit is studying Dalit rights, it becomes an entirely different thing to a non-Dalit studying it. An NRI studying voting rights in India is entirely different from a native Indian doing so. Nothing is banned. But statement is necessary. The researcher must articulate her/his position. Then comes the declaration of the purpose of the study. It is so relevant today where, for example, pharmaceutical companies commission research with a purpose to prove the potency of their drugs. Intention is important. In ancient India, the researcher/seeker had two choices, either s/he approached the guru/institution or pursued profound questioning of existing systems. Questioning the existing systems has been a serious method. It is amazing that with the help of accurate methodology, such systematic Vedic indices were created that even to this day, no tinkering is possible. The meter, exact number of hymns are intact. No interpolation or deletion can be done. The research procedure can be outlined as Vishaya (subject matter) ~ samasya (doubt) ~ poorv paksha (objections) ~ siddhant (thesis) ~ samanvaya (review and conclusion). Once the topic is decided, the researcher expresses her/his doubts, problems, what led her/him to research the topic. How her/his interest is awakened in a given area. Then the researcher describes the previously held view which could be different from her/his hypothesis. What the earlier treatises say on the subject. Then comes the main portion of the research where the researcher discusses, explains and proves her/his view as convincingly as possible. Finally, comes samanvaya. The earlier views and the new perspectives are coordinated. A conclusion is achieved. This is unique to our system. We usually reach a consensus. Unanswered questions are not left to be swimming into the air. Doubts are cleared. A conclusion is reached. In this sense we can say that Indian methodology is logo centric. It believes in meaning and purpose. "Tantrayukti" is a set of exclusive technical devices used in research related to literature. "Tan" means manifestation. It signifies the ability to spread and expand. Yukti means to unite, to make a cohesive unit. Basically, research is about elaboration first and then cohesion. First, we go deep and wide into a subject and then bring it back in an organized unit. All Indian methodologies put emphasis on word analysis. The etymology of the words used, their sandhi vichchhedda (division within words), arrangement of related/unrelated words and sentences, and interpretation of intricate meaning of words - these things are important. We go to the sublime later, first we keenly look at the word itself. Indian methodology also emphasizes on "relatedness" of all branches of knowledge. Charak, for example was a doctor. But he was equally good at words and aphorisms. This brings us to aphorisms. Indian treatises are master collection of aphorisms. We as Professors of English always discuss aphoristic style of Bacon. We should also know that Ashtadhyayi by grammarian Panini is a book of 4000 aphorisms. The art of saying much in less, aesthetically arranged words is a much sought-after quality. We look up to aphoristic style of writing. To come to Tantrayukti, it has eight components - Reeti (way of writing), Guna (quality of the word and meaning), Alankar (literary embellishment), Vakraokti (equivocation), Rasa (resultant emotion), Dhvani (suggestion), Anuman (inference) and Auchitya (propriety). This is the modus operandi of research methodology. We have to focus on style first. How words have been used. That is the first thing. Then we have to go to the quality of words and also the quality of meaning. Manana (thinking) is important. We have to drown ourselves in the text. Then comes the stage of noticing and noting all the literary devices used, figures of speech and all possible embellishments. The stage of focusing on Vakraokti is so important for a researcher of literature. The meaning is hidden. Sometimes, the reader/listener conceives a different meaning from what is intended by the writer/speaker. What the West calls reader response theory. This is India some five thousand years ago. Here we may also note that there is no permanent or fixed meaning. The meaning changes as per vyakti (indiavidual), desh (place), kaal (time/age) and paristhiti (circumstances). The same person can interpret a text in more than one way, given the other variants. Then we come to the much celebrated Rasa. Rasa is taste, just like the sweet taste of sugar on our tongue or the bitter taste of chilly. When we read a text, or watch a play, we experience the nine rasas, namely, Rati (love), Hasya (mirth), Shoka (sorrow), Krodha (anger), Utsaha (energy), Bhaya (fear), Vibhatsa (disgust), Vismaya (astonishment) and Shanta (peace). The detailed study of Rasa theory also covers the theory of emotion as it is studied in modern Psychology. The researcher of a literary text is expected to experience Rasa and also explain them. Then comes Dhvani, the beautiful, tickling concept of suggestion through sound waves and words. Suggestion is the main appeal of poetry and literature at large. Every utterance means more than it says. The subtleties of language are to be explored and explained. Vaak (speech) written or spoken plays games. Sometimes it suggests something, yet at other times it suggests something else. Just as chaff is winnowed from grain, the researcher has to dig deep into meaning, references, inferences and suggestions. Reading literature is art. Great texts are not only written by great minds, they are equally created by great readers. The ancient texts give many examples like “singho vatuh” (the student is lion), “yaastikaam bhojaya” (feed the stick) and “annampraanaah” (food is life). Obviously, a student is not a lion, we cannot feed a stick or food is food and not life. In all these sentences, we have to draw inferences and understand. The true student, the ideal student has or should have qualities of a lion like bravery, fearlessness, initiative, physical strength etc. Similarly, we should feed those who need stick for walking and support. We should feed the old, the needy, the weak etc. Similarly, food is the basis of all life, sustenance of life. Therefore, it is equivalent to life and must be respected etc. Dhvani is an endless mine. It is so rich that many lectures are needed to grasp its depth and vastness. Then we come to Anuman. It is about the experience of a text, what we call "feel good" factor of a book or the just opposite of it; whether the text is elevating, inspiring, thought provoking or depressing, shocking, disturbing etc. The feel of the text is to be experienced and explained. The last tool of Tantrayukti in literature is Auchitya (propriety). Indian methodology lays special emphasis on propriety of words, meaning and message. Everything is designed for the upliftment of the individual and society as a whole. Positivity marks the approach. Research methodology can be used to prove a point or a thesis or hypothesis by using previously mentioned methods. It can be applied as a tool of reasoning, analysis, argument, debate and finally resolution. We intend to resolve issues through research. A meeting point should be reached. It can be used for connecting the dots and unifying similar approaches. It can be used for mimansa which means revered thought. Mimansa implies exact meaning, inferred meaning also knowing the aim of the author. We can go by vaak yojana (arrangement of words) or arth yojana (deeper meaning, information flow, logic and message). Our methodology moves from the science of inquiry to the science of soul. It is a highly developed mechanism in which the quality of the researcher, her/his dedication, and perseverance matter the most. Theoretical knowledge and practical application cannot be separated. They are like two wheels of a vehicle. Both must move otherwise the vehicle does not move. Tantrayukti oils and smoothens the coordination between the wheels, works as an enabler of the journey, makes it pleasant and helps in reaching the destination. Each science, music, dance, painting, drawing, rhetoric, theatre and poetry have to be understood with separate set of rules. Yet there is similarity amongst all. Dictionary meaning cannot be applied exactly. Indu (exact definition) has to be supported by arundattah (context). The context is vast and varied and it changes. The methodology, methods and doctrines are to be chosen by the researcher which are spread over mimansa, yoga, purana, vyakarana and Smriti. Each research project needs its unique tools. Thus, Tantrayukti is application of scientific rules according to context and the purpose is to reach a consensus. 1. Das, Sanat. Research Methodology. 2012. Jaipur: Yking Books. 2. Seth, Kalpana. Research Methodology in English. 2010. New Delhi: Murarilal & Sons. 3. Sinha, M. P. Research Methods in English. 2008. New Delhi: Atlantic Publishers. This lecture was delivered by Prof. Shubha Tiwari at a Research Methodology Workshop jointly organized by Ministry of Human Resource Development and Iswar Saran PG College, Prayagraj on 9th January 2019.